Plaquenil is a drug used in the acute treatment of malaria. It is also used in the long –term treatment of rheumatoid arthritis and lupus erythematosus. Its generic name is hydroxychloroquine sulfate. Chloroquine has been replaced with hydroxychloroquine as it has less side effects. If a person is going to be treated long-term with Plaquenil, they need to have a thorough dilated eye exam with best corrected visual acuity, central visual field, color vision, and dilated examination of the retina. The medication can cause retinal toxicity which is dose related. You should have an eye exam annually in the beginning and as often as every 6 months if you have been on the medication for a while. Plaquenil should be used with caution in people who have a history of liver disease. Patients should have periodic blood tests with prolonged therapy. The goal with ocular screening for the side effects of Plaquenil is to find the damage at the earliest stage to reduce the amount of vision loss. The risk is low in the beginning and increases over time as the drug collects in the retinal pigment epithelial layer. The risk of damage is dose related. For the first 5 years annual screening is appropriate. In addition to the previous discussion of a thorough complete eye exam with best corrected vision, central visual field, color vision, and dilated retinal exam, other tests include multifocal ERG, spectral domain OCT, and autofluoresence of the macula. Daily doses over 6.5 mg/Kg and cumulative doses of more than 200 grams increases the risk of developing retinal toxicity. Adverse reactions are similar to those with treating Malaria plus increased skeletal muscles palsies, myopathy, and/or neuromyopathy. If your doctor starts you on Plaquenil, you need to see an eye doctor before starting the medication. 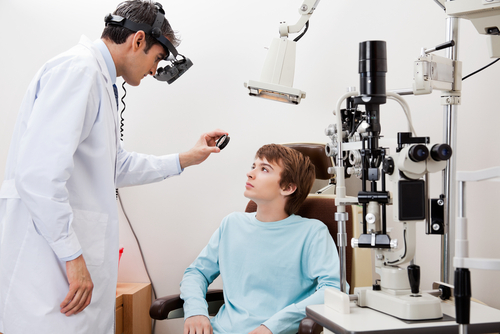 It is very important that you are monitored by an eye doctor as long as you are taking the medication.